The five of us squeeze into a cafe around a table built to hold three. It’s regular coffee, regular breakfast toast, regular everything, but we linger a bit more than we should. Goodbye waits outside the door. Last hugs wait. FIve becoming four waits. Goodbyes are easier when you don’t know they exist. Clement said goodbye and we figured on seeing him in a day or two. Won Gyu got a day ahead and I always thought we would catch up. The trail weaves a lot of threads, fast and slow, looping them back and forth in ways you don’t understand. There is always a chance you’ll see someone again until their thread runs out at the end. How long before the next goodbye, I wonder. Tarifa is still a long ways away. How long before four becomes three, three becomes two, two becomes one and I am alone again, walking south toward the end of Europe. I was used being alone once, before I arrived in Saint Jean, before I knocked on that first albergue door. It will be harder now. I’ll feel it more like I felt it at the beginning. I try to not think of it, to focus on Amelie’s laugh instead or Jorgelina’s scowl when she pretends to be her alter-ego Carlos. I don’t want to trade the present for thoughts of the future. The trail always ends somewhere, it cannot last forever, but if I do it right, the end is nothing more than the last steps. Slowly, we nudge to the door. We fall out into the street. We put on backpacks and stand together one last time. We hug. We cry a bit. We laugh and snap one last picture. 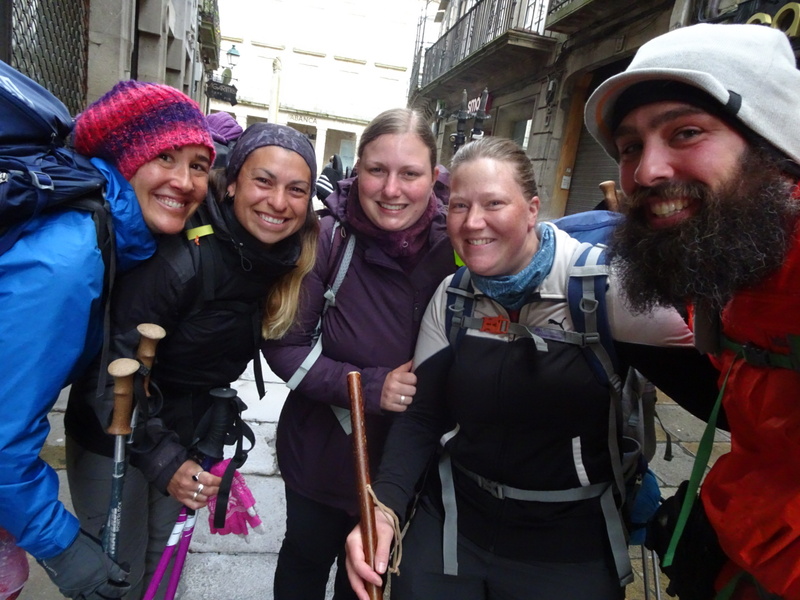 Then we walk away, Christina toward the bus station and home, the four of us onward toward Muxía, Finisterre, and the sea. Great picture D. Maybe a 10 year reunion in __________? God to know that some of you continued on to the coast. Sweet. How about “So long for now”? Considering all the elements that brought everyone from different parts of the planet together at the specific place in Spain at the specific right moment to meet, I’d prefer “So long for now, until we meet again”. Good byes are hard. Your memories will last a lifetime. The future is waiting for you to show up and make a difference. Namaste.